Last week I completed construction of the 24-inch box loop. As previously described, the frame is composed of 1 x 2 inch furring strips, notched at their centers, and screwed together to form a cross. Length of each member is 33.9 inches (24 x 1.414). 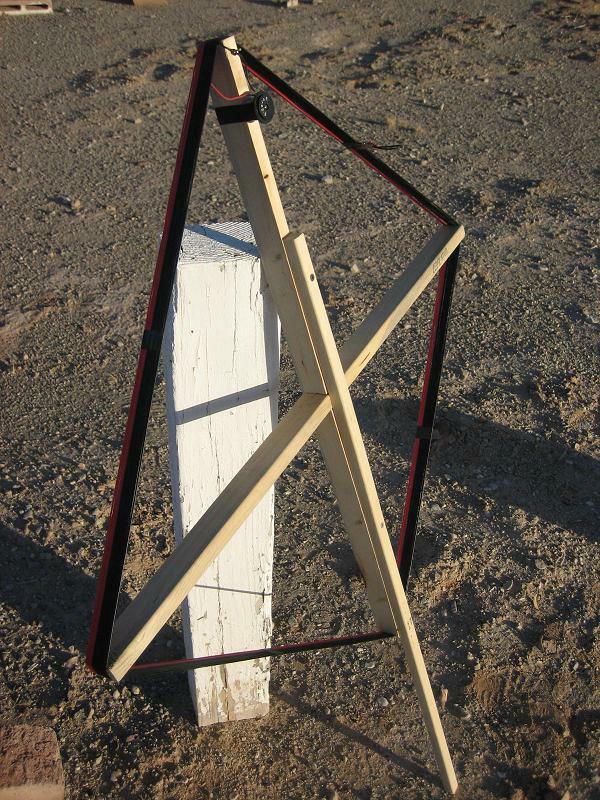 A 36 inch piece of 3/4 x 3/4 inch wood is screwed to one of the cross members to form a pivot, which will rest on the ground, elevating the loop to chair height. Using a wood file, a wide, flat notch was cut at the end of each member to keep the coil turns in place. Sixteen turns (128 feet) of 20 gauge insulated wire was then close-wound on the frame, secured by small nails at each end. Earlier this summer I rescued a small AM-band variable tuning capacitor from a very old transistor radio. It will serve as our tuning device. Using vinyl electrical tape, I taped this to the end of one of the cross members. These capacitors are actually two capacitors in one. In a superhet radio, one section tunes the signal and the other section tunes the superhet oscillator at 455 KHz higher than the signal, therefore this second section's capacitance is less, and not usually usable for tuning a wide range. We will use the section with the greater capacitance (the first section mentioned) to tune the loop. Tuning range of the loop was found to be 530 KHz to about 1400 KHz. 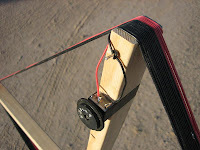 A short clip lead is used to short about five turns of the coil to allow tuning to the top (1710 KHz) of the band. Turning the loop, signal peaking and nulling is fairly sharp. Signal strength increase over a barefoot radio is excellent and better than a 7-inch inductively coupled, tuned loopstick. Local electrical noise pickup is low, but the loop will transfer noise if pointed towards close noise sources. Atmospheric noise pickup is very low, and the signal-to-noise ratio seems markedly better than the tuned ferrite loopstick. Performance. Inductively coupled to the Tecsun PL-600, signal strengths off the loop are equal to or greater than the 240 foot longwire attached to the Eton E1 last winter here at this location. 500+ mile mid-day DX is routine. KGO-810, San Francisco, CA, and KALL-700, N. Salt Lake City, UT are exceptional during the day using the loop, and are not receivable using the barefoot PL-600. The 24-inch loop is a good compromise between a small loop and a large one. It is easily transportable. Try building one for yourself.